classify please and guess where he could be from. perhaps i should give more clues for classification. in fact i do notknow what his ancestry is, so i would appreciate help, but this man is almost like a joke for racial classification. 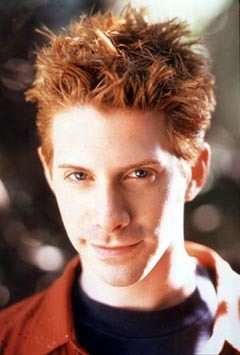 Seth Green - Very funny young actor who has become well known in the last five years. Green had a co-starring role in "Buffy, The Vampire Slayer" from 1998-2000 (Daniel "Oz" Osbourne). He appeared in all three "Austin Powers" movies as Dr. Evil's teenage son, "Scott Evil". Green was born in Pennsylvania in 1974. We saw an interview with him in which he noted he was kind of a "class clown". He also said he was bar mitzvahed. Green has actually been acting since he was about ten years old and has a long list of credits. One of his earliest roles was in Woody Allen's "Radio Days" (1986). The film is about Woody's childhood and Green plays Woody at age 11 or 12 and he is quite good. In one memorable scene, Green (Woody) is caught stealing from the Jewish charity box. A "big" sin. He is brought before the rabbi and the rabbi tells him how bad he has been. Green, however, is so into his radio programs, like "The Lone Ranger", that he responds to the rabbi's lecture with these words, "You speak the truth my faithful Indian companion." Needless to say, the rabbi does not take kindly to being called "an Indian companion". It's really too bad Green is not a bit taller. We expect his choice of roles would be much bigger if he was somewhat taller. Still, he has already built a really good career based on great comedic timing and 'likeability'. He may have partial Jewish ancestry, but then again, jewhoo.com will state anyone is Jewish insofar as they can. Regardless of whether or not his ancestry is totally Jewish, such overt rufosity is rare amongst Jewry. Why's that? He looks pretty American to me. Green eyes? Where do they come from?